- will either of these be ok with a purple, I have heard that Purples can be a bit mean. I have been told a Blue tang would be a good one to put with the purple. It will most likely harass any other herbivore. including the foxface. It might be okay if you use an aclimation box, or if you luckly get a foxface that can fend for itself. I would introduce a kole rather than PB, as kole do not exactly feed on the same type of food as purple tang but PB do. So it might be more tolerant towards the kole. The 3 fish you mentioned should be fine with a purple tang, I'd go with a yellow eye kole over the brown tang but that's personal preference more than anything else. Once you're ready to add the new fish I'd just make sure that the tang is well fed and add the fish after lights out. This will help mitigate any aggression, there will probably still be some when lights come back on but should only to establish a "pecking" order. As far as the blue tang goes, I'm far from the tang police but I think those are best in at least a 6 foot tank and 200+ gallons, a 5 foot tank just isn't big enough for those beauties. That said I have seen blue tangs in as small as 75 and 90 gallon tanks but they are usually still on the small side, it's just not something I'd do. OK thanks. I do like the Yellow Eye Kole so maybe I will try that one at night time. May add a wrasse at the same time at night, to get a lot of new commotion there so not all focused on 1 newbie. 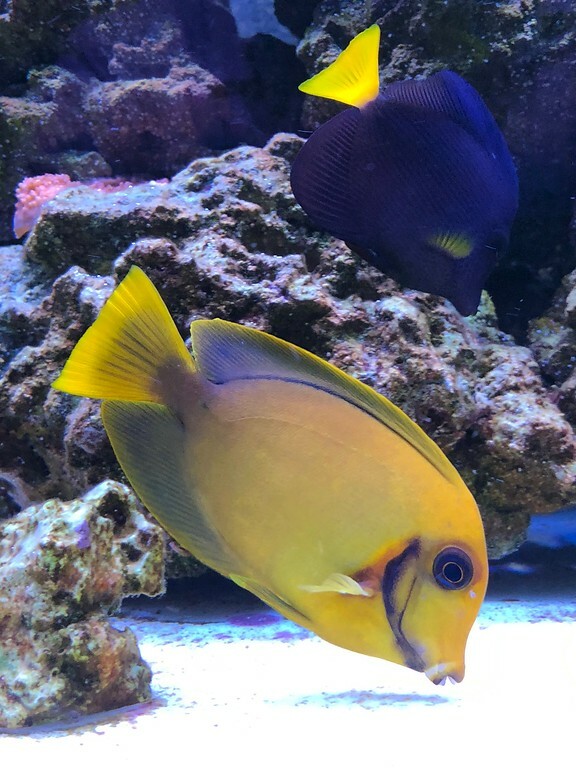 I have a smaller (2") Purple Tang with a medium (4") Blue Tang (Hepatus) and medium (3") "Philippine" Yellow Tang (maybe Acanthurus pyroferus) in a 4 foot, 88 gallon tank, and I see no real aggression between the tangs. I've had the Blue tang for 5+ years, and originally had it in a 28 gallon JBJ tank for 2 years, then moved it into a custom 2' cube for a couple of years, before moving it to the current tank in January; so I'm definitely not the tang police. So, yes, I have quite a bit of bioload, but the tank seems to handle it well, and I have little aggression between the fish. Your tank is too small for a blue/hippo. Whether the purple will be OK with additional tangs is hard to say. The purple is among the most aggressive/least tolerant of tangs …. but fish are also individuals, so YMMV. I'd certainly not attempt another zebrasoma, but those of differing genus are possible. Mr Purple seems fine with most of the existing fish right now, the clowns put him in his place when he gets too close to their hideout, but he certainly swims like he owns the place Do enjoy having a purple. Ouch! 3 tangs in a 88? Yep, and it still looks quite roomy in there! Frag tank actually. Now back in the display and there's an uneasy truce between the two of them. Cool, I have a 20 gallon sump, may have to use that if necessary when I go to add my fish. I like the White Tail Bristletooth Tang, will try that and a wrasse at the same time. Thanks for this! Of course my guy seems like he has a lot of personality, so not sure how he will take to a new tang if I am being honest; I will see if I can catch him and sump him for a few days while the new guy (whenever I decide to get it) comes along. Now the question is, how do I catch him.....open to best practices. I will see if I can catch him and sump him for a few days while the new guy (whenever I decide to get it) comes along. Now the question is, how do I catch him.....open to best practices. my preference is a specimen container. Some cheap/thin acrylic. I've had decent results using a stepped bit from Harbor Freight drilling holes for circulation. PVC parts for hiding. I also like to scuff the bottom for a more opaque look - personal preference on that. The new additions camp out here for a few weeks. Everyone "gets accustomed" without the thrashings. For what its worth, I added my purple tang last and he still went after my fox face. I was concerned at first but it actually was beneficial and amusing. Beneficial because the fox face was a skittish fish before the attacks and now swims freely in the open. Amusing because the fox face didn't get phased by the tail slaps, he'd just turn his body and throw up the spines like "come at me bro". The two would just swim along together like nothing happened 30 seconds after each tiff.